All Six Void Wraith Novels on Sale for 99 Cents Each! Hold the Line, book two in the Ganog Wars series (a new Void Wraith series), has been released on Audible. Continue the Ganog Wars story, following the adventures of Fizgig, Nolan, Khar, and more, that began with Behind the Lines! Listen now on Audible! Press the Line (Ganog Wars Book 3) Released on Amazon! Behind the Lines, book one in the Ganog Wars series (a new Void Wraith series), has been released on Audible. Listen to further adventures of Fizgig, Nolan, and more as they encounter new races and fight giant mechs from behind enemy lines for survival! Listen now on Audible! Hold the Line (Ganog Wars Book 2) Released on Amazon! One of Chris’s short stories, Planetstrider, is featured in a new science fiction anthology, Galatic Frontiers. 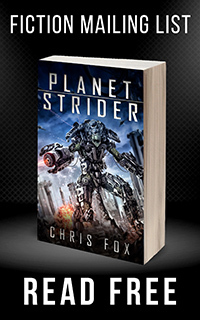 Planetstrider is the prequel to the newly released Ganog Wars series. Galactic Frontiers is a collection of space opera and military science fiction stories by 16 different authors. Check out the details below! Sixteen talented authors. Sixteen remarkable stories…. Behind the Lines (Ganog Wars Book 1) Released on Amazon! Behind the Lines, the first book in the series Chris wrote for his 12 Weeks to a Trilogy project, has been released on Amazon! Mankind’s newest fleet has just been obliterated. Attacked without warning, enemy unknown. Their last transmission originated from a world on the edge of known space. Alpha Company is dispatched to investigate…. Copyright © 2019 Chris Fox Writes. Powered by WordPress. Theme: Spacious by ThemeGrill.